Why a Rasta Cake you'd like to say? It was made for a special 21st Birthday. Her son was a handful and liked to smoke weed, she decided a Rasta Cake was just what they need. 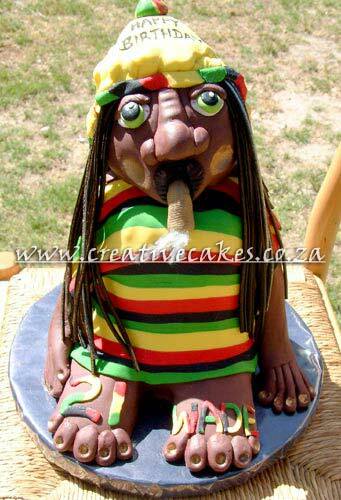 The Rasta Birthday turned out quite a jol, with this Rasta Cake complete with a zol. The Rastafarian religion started off in Africa . It is often linked with the poorer black population of Jamaica . It is not just a religion, but a way of life. Rastafarians speak out against; poverty, cruelty and unfairness, not just religious ideas but global problems. Rastafarians will use the Holy Piby, the Kebra Nagast and the Bible (interpreted with a Rasta Soul) for guidance.